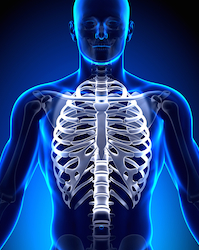 Sternum Fractures | Nashville Injury Lawyers The Law Offices of John Day, P.C. The sternum, commonly called the breastbone, is the long bone in the center of the chest. It is attached to the ribs and forms a protective enclosure for vital organs, including the heart and lungs. Sternum fractures are typically associated with deceleration injuries (injuries that occur when an impact makes a rapidly moving object suddenly stop) and blunt chest trauma. Broken sternums are often seen in motor vehicle accidents, caused when the steering wheel collides with the driver’s chest. In fact, because these injuries are associated with impacts from quick decelerations, the introduction of seat-belt legislation and over-the-shoulder type restraints actually resulted in an increase in the frequency of sternum fractures. In addition to motor vehicle accidents, broken breastbones may be caused by vehicle-pedestrian collisions, falls, or any other direct chest trauma. Sternum fractures usually cause chest pain and chest spasms. If your sternum is fractured, you may have a hard time moving, coughing, sneezing or taking deep breaths. Your chest area may be painful to the touch and exhibit swelling and bruising. Chest pain may persist for 8-12 weeks following your injury. Some people who suffer from broken sternums may actually have a visible external deformity. This deformity can show up as a bend or indentation in the chest that can be seen and felt. Fortunately, the sternum will often heal on its own. Your doctor may recommend rest, medication, and other minimally invasive treatment plans. The treatment needed, however, will likely depend on whether your fractured sternum is accompanied by additional injuries, as approximately two-thirds of sternum fractures occur in conjunction with other injuries. If you have suffered a sternum fracture due to someone else’s negligence, our experienced attorneys can ensure that your rights are protected. Call us as soon as possible at 615-742-4880 or toll-free at 866.812.8787 so that we can review your case in a no-cost, no-obligation consultation. We handle all accident cases on a contingency basis so we only get paid if we recover money for you. We have recovered well over 100 million dollars for our satisfied clients and we would like to help you too.